Anti static layers in resin flooring deals with the problem of an electrical charge building up in the surface – which can be extremely hazardous in certain environments. Anti static flooring has an epoxy layer to prevent the charge from building up – helping to avoid any minor shocks when bare skin touches the surface and, more crucially, sparks that could ignite combustible fumes in the air. How does anti static flooring work? Static usually does not build up on a porous floor, because of the presence of small amounts of water, but for hygiene and safety it can be preferable to install a non-porous floor, and this is when static charges can begin to occur. There are unique benefits in the use of anti static surfaces for the electronics industry, where highly sensitive microchips can be permanently damaged by the presence of an electrical static charge. However, we would advise considering whether you need an anti static layer in any industrial flooring installation, as it does not detract from the other features of your floor and is generally something it is preferable to have. Prevent shocks and damage to electronics from static charges in the surface. Allow the use of non-porous flooring without creating a static electricity issue. Ideal for hazardous areas with combustible vapours, flammable materials and powders. 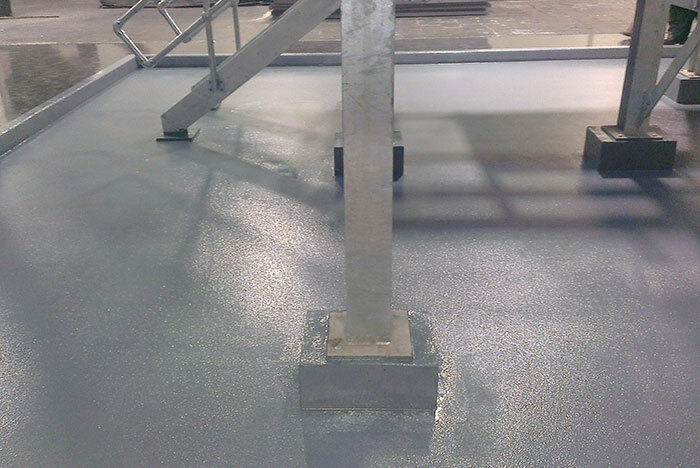 Can be used with other types of resin flooring, non-slip and coloured surfaces, and primer layers. Do I need anti static flooring? There are certain industries already mentioned above where anti static can be a necessity – including in the manufacture of electronic components that might be damaged by the presence of a static charge. If you work in hazardous areas, particularly where there are vapours or gases that could be ignited by a single small spark, then again anti static flooring is probably a necessity. For industrial projects where you are not sure if you really need an anti static layer or not, we would urge you to consider it. It does not prevent you from using any of the other features we offer, from visual finishes like epoxy paint and line markings, to built-in features like hygienic surfaces, extra grip textures and primer under-layers to protect against damp and oil.